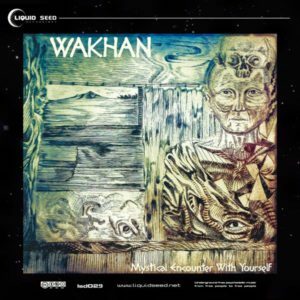 Liquid Seed Recordings presents Mystical Encounter With Yourself, a full album by Wakhan, a project formed deep within the consciousness of Alejandro Pantoja (AKA Panto), a Bolivian producer based in Spain. This music is the product of long, introspective journeys into the depths of consciousness, where the real being resides, where the circles closes, forming the most pure and sincere expression. Every track is a facet of different psychedelic experiences, beginning with beautiful and evocative melodies reminding us of the infinite beauty of existence, following with a trip through perspectives and dimensions, deeper into the more mystic side of reality. “All the journey began when I realized that I had no body—I was a conscious and pure energy just observing amazed what was happening around. Then the organic and mechanical train began its eternal tour through a city made of spiritual machinery…” Mastered by Koschitzky Mastering in Madrid with artwork by Dydier, Wakhan’s spirit-linked brother. MP3 Download | FLAC Download | WAV Download · Download count: 19,637. Me ha gustado mucho!! Esas bonitas melodias y esos ambientes misticos me atrapan. this is very good and original! This is a GREAT album! We’ve had lots of good music here on Ektoplazm this year, but this one might very well be one of the serious contenders for free album of the year. Really nice. I’m enjoying this. I am really happy with this release and I'm working hard for the next one. More frequencies, more feelings and more music is about to come. please help! am downloading mp3 format and after the download it says your windows cant open this compressed file? what is wrong! Wow, this is fantastic, Great way to start off 2017 !! Exceptional album. Not sure i’d call it ‘deep trance’ but melodic and trancy. Thanks artist & Basilisk. Looking forward to more releases.